I spent most of yesterday evening and well into the night putting up the last of the green tomatoes — not only my own, but a whole bunch of them from a friend’s garden as well. Sadly, I waited a bit too long and some of them had spoiled, but I did have a satisfactory result nonetheless. 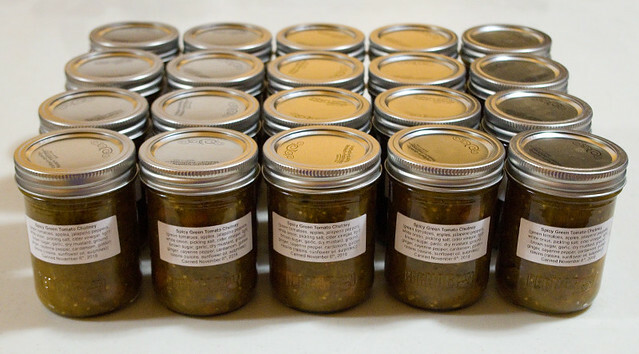 That’s twenty 250mL jars of spicy Green Tomato Chutney, the recipe for which can be found on page 208 of The Canadian Living Complete Preserving Book (2012). 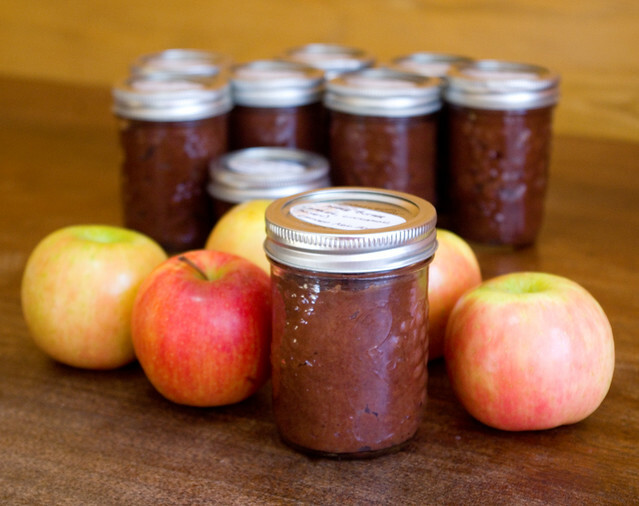 I’ve made a few versions of this chutney over the years (I believe I have at least four versions in different cookbooks on my shelf, let alone the ones that can be found online), but this is by far my favourite. I was really happy with how it turned out this year! I made it a little hotter than usual by including the jalapeno seeds, but otherwise I kept the recipe the same. I labeled mine as “spicy” this year, and it does have some heat, but given that chutney originates in India, it’s not the spiciest one out there by far. To me, it’s just spicy enough to pack a nice punch. Chutney is supposed to be savoury and sweet and spicy all at the same time. Preserving says this version is especially good with eggs in the morning, but I would say that it is great on a sandwich or grilled cheese or burger, with cold cheese, with most meats, with roast potatoes or other veggies, as a dip or a glaze… Basically, if you want to take the flavour of anything savoury up a notch, chutney is perfect. And now I have five liters of it, some of which will stay in my pantry, and some of which will become Christmas gifts. After experimenting last year with different salsas, my husband (the main consumer of salsa in our household) determined that he liked the Blender Salsa the best. 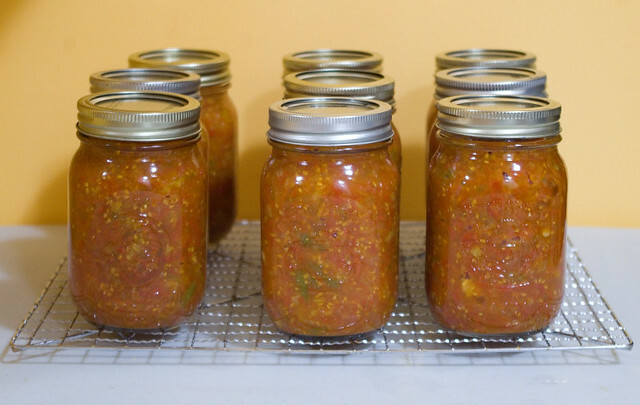 The recipe for this easy salsa can be found on page 92 of Preserving by the Pint: Quick Seasonal Canning for Small Spaces (Marisa McClellan, 2014). 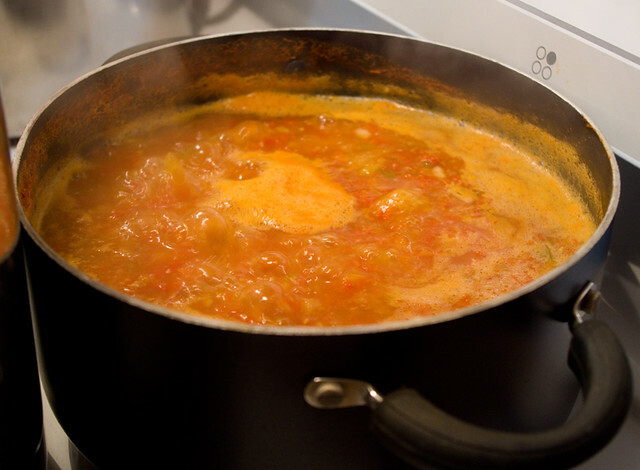 As with last year, I had to boil the salsa down a bit as it was quite watery to begin with, which is a result of using cherry tomatoes from my garden instead of the Roma tomatoes that are recommended. This ends up making it taste a little bit more like tomato sauce than true salsa, but my husband doesn’t seem to mind. Good thing, too, since I’m not about to peel and core literally hundreds of tiny tomatoes for a few liters of salsa. It’s just not worth it. My final result for this round of canning was nine 500mL jars of blender salsa. As the tomatoes ripen I realize that there will definitely be more — as requested by my family. I’m also hoping to make up some Healthy Veggie Tomato Sauce with the produce from my garden, and also some extras from a friend’s garden, since I’m told that they ended up with way more tomatoes than they plan to use this year. Bonus for me! 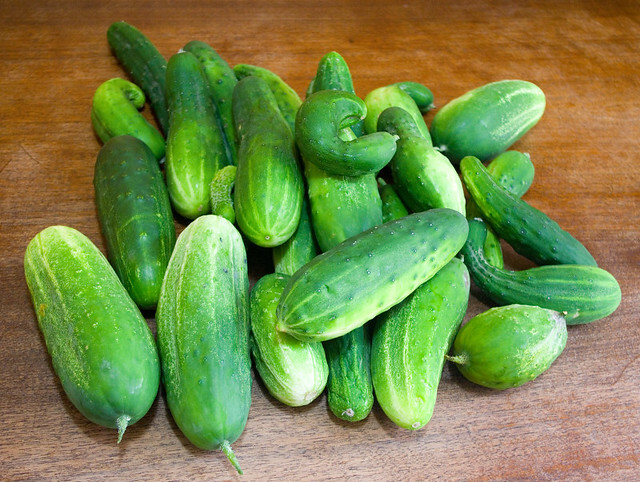 This year, I grew my own cucumbers out in the garden for the very first time. (Okay, I tried to grow lemon cucumbers a few years ago, but I only ever yielded the one gourd.) Given this year’s high yield after it finally started to rain at the start of August, I thought that I should preserve some of my crop by turning it into pickles. 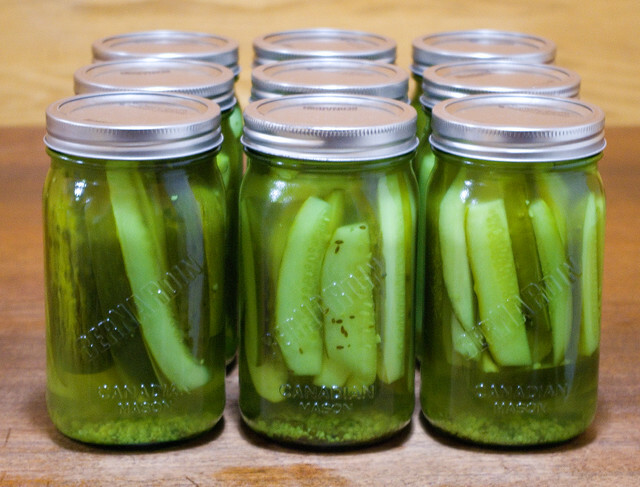 A friend of mine had already used up an entire container of Bernardin Dill Pickle Mix‘s worth of pickles, and she wasn’t terribly interested in making more even though her cucumber vines were still yielding fruit. So she gifted me with all the extra cukes she had that were currently ripe, and I combined them with my harvest to date. It filled one entire crisper in my fridge. 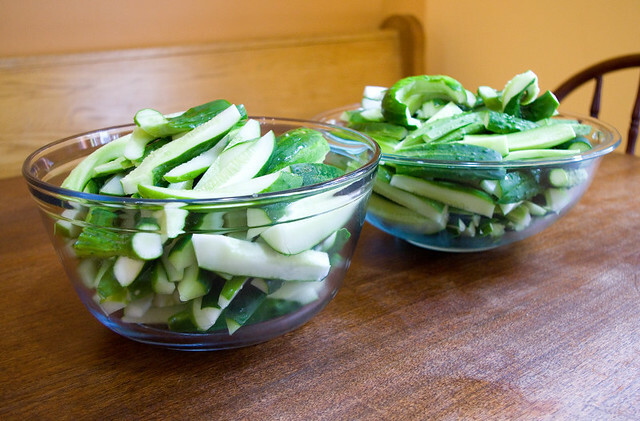 Sliced up, all those cucumbers yielded two big Pyrex bowls full. 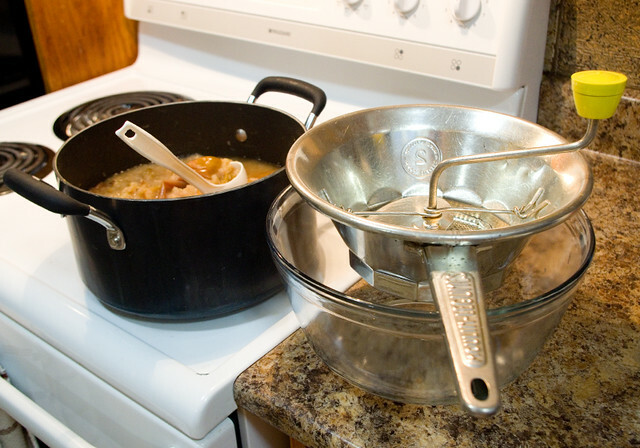 I filled my biggest stock pot and my pressure canner (which works perfectly well as a huge stock pot if I don’t lock the lid) with water, and I washed all the jars and rings and lids while I waited for the water to boil. With that much water, it takes quite a while. Then, while the jars and tools were sterilizing in the boiling water, I prepared the vinegar and spice mixture. Then I packed the cucumber slices into the jars, added the vinegar mixture, wiped the rims, put on the lids and rims, and processed the jars. All in all, the pile of cucumbers yielded nine 1L jars. They all sealed properly and didn’t need to be re-processed, thank goodness. It’ll take a good six weeks or more before the pickles are ready to eat, since the longer they sit in the vinegar mixture, the better they taste. They should be ready for Christmas, at least! Or even Thanksgiving. We’re right smack dab in the middle of Christmas prep around here, dashing from hither to yon to prep for school spirit days, family events, and hosting over the holidays. 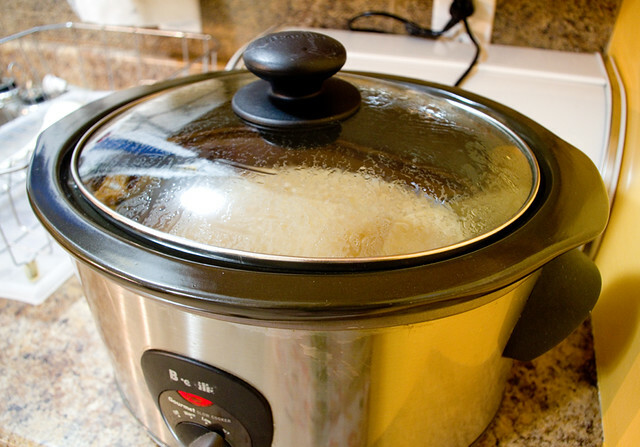 Of necessity, suppers have been quick and easy; I think tomorrow I will be breaking out the slow cooker just to make dinner that much easier. Last night, though, I rummaged through the freezer and turned up with some rather nice basa fillets. I dredged them in flour, sprinkled them with a bit of garlic powder and salt, and lightly fried them in a glug of olive oil in a non-stick pan. 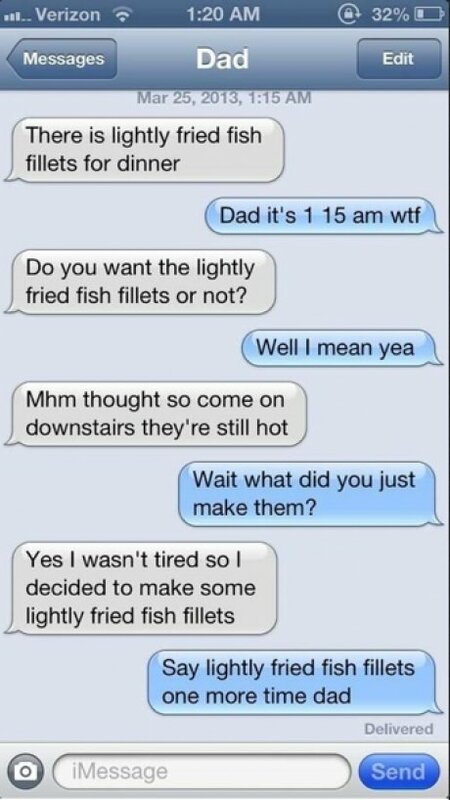 (As an aside, when making this kind of dish, does anyone else think about that lightly fried fish fillets meme?) 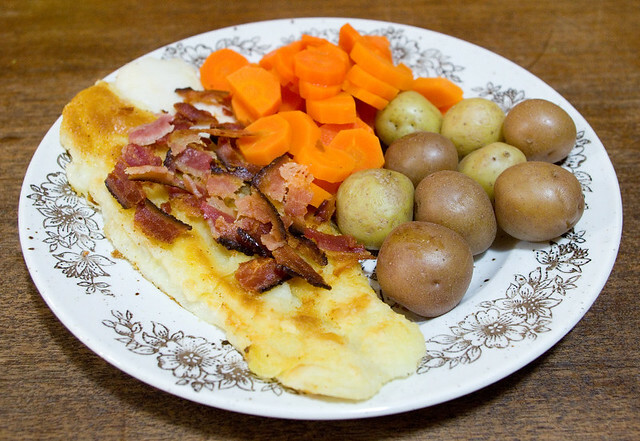 I topped the fried fish with crumbled bacon and served it alongside boiled baby potatoes and steamed carrots. I still wasn’t feeling spectacularly well last night, so I didn’t get as much prep work done as I wanted to, but the hectic pace around the holidays is one of the reasons I start canning way back in the summer. 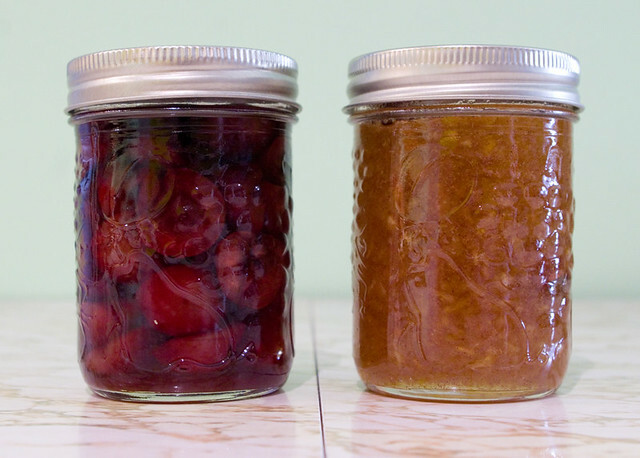 As planned, I plunged into my shelves of homemade preserves to get gifts together for my kids’ teachers. As with Guiders, I consider teachers to be especially important to my children and, as such, they are deserving of some nice things around Christmas to show my appreciation. Teachers put in long hours in a job that I, to be completely frank, am vastly temperamentally unsuited to do. Before my children were born, I seriously considered home-schooling, but as time went on I realized that teaching is definitely not one of my gifts. I have the utmost appreciation for those people who can do so, especially while both funding and support are slowly withdrawn from the public school system over the years. 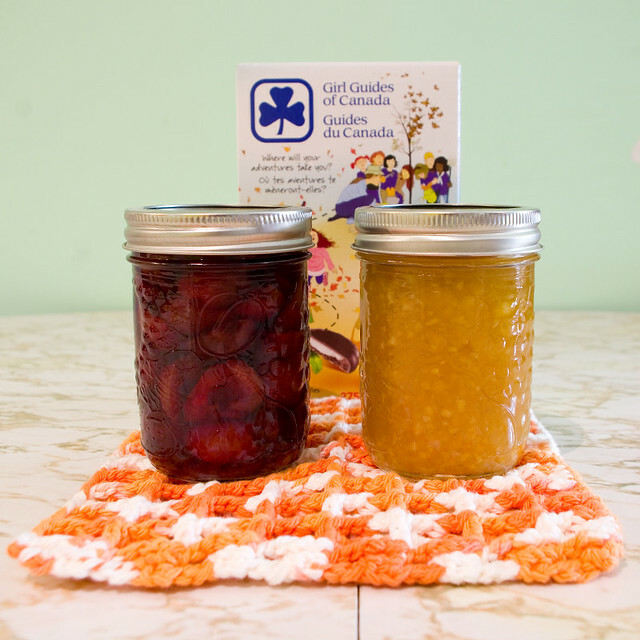 This year, my kids’ teachers are getting amaretto cherries, spiced pear jam with pineapple, handmade cloths, and a box of Girl Guide cookies. (I considered giving the cookies to the Guiders too, but I thought they could probably use a break from this fundraiser by this point.) I hope that the teachers will be able to enjoy these foods over the winter break — or any time after, really, as they’ll last about a year unopened. It looks like I have finally made it through my not-inconsiderable list of foods that I wanted to put up for the winter. 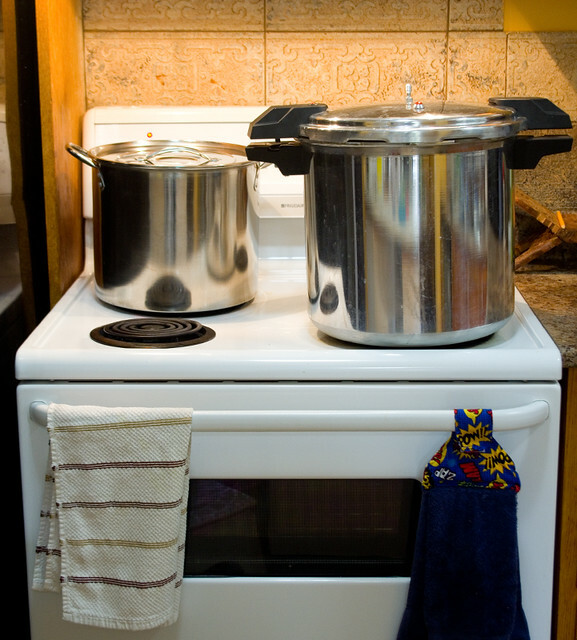 I mean, I still have two pumpkins left to roast, but the puree is just going in the freezer, which doesn’t take nearly as long as hot water bath canning or pressure canning. If I don’t have to lug my canning rigs and bunches of jars out of the basement, it doesn’t count. 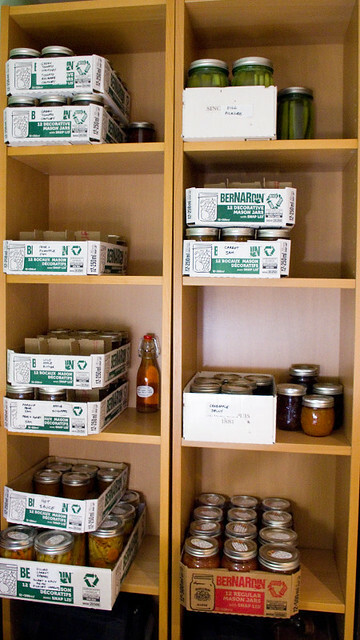 The last two things to put up were parsley jelly and hot sauce, both of which contained produce grown in my garden. I brought a big pot of parsley in with the first major cold snap about a month ago, and I kept it alive until I could chop it up for the jelly. The peppers for the hot sauce were brought in as they ripened, and then were frozen. This isn’t the greatest solution if you want your peppers crisp, but if you’re just going to run them through a blender or food processor, it doesn’t really matter. This way I was able to cook up a whole season’s peppers at once, instead of using them up individually as they became ripe. 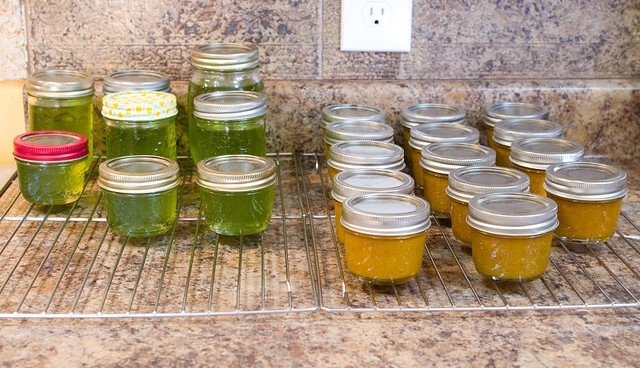 I was curious to try the parsley jelly (from page 298 of Preserving: The Canning and Freezing Guide for All Seasons by Pat Crocker (2011)), since I’d never heard of it before. Mint jelly, sure, but not parsley. Apparently it’s and English thing? 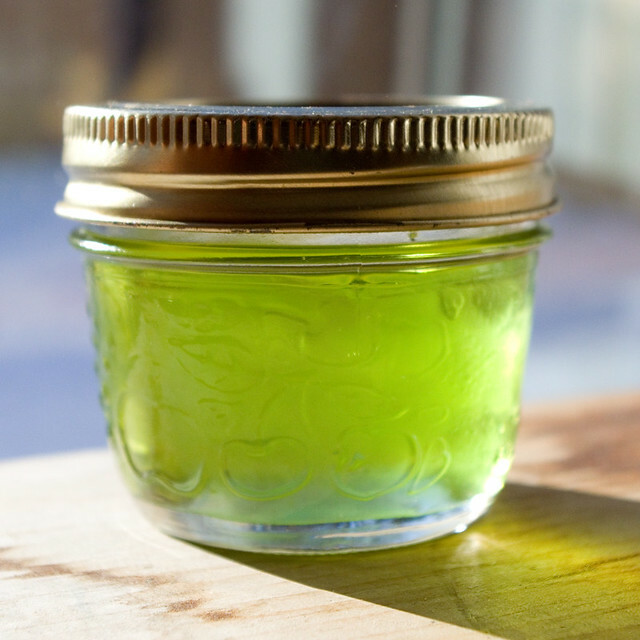 This jelly can also be made with sage, thyme, or basil, in addition to the mint that I’m familiar with. Sadly, as good as it looks, the jelly didn’t set despite following the instructions to the letter. That’s why I added a “maybe” to this post title. I mean, I could just give up and chuck the unset jelly, or I could try to re-cook it. I’ve used this technique in the past and it has worked out well. But I am so incredibly busy with the Christmas season at the moment that I might just give up and try again another time. My hot sauce, however, turned out wonderfully. Since it’s a puree, it’s not like I have to worry about the set. 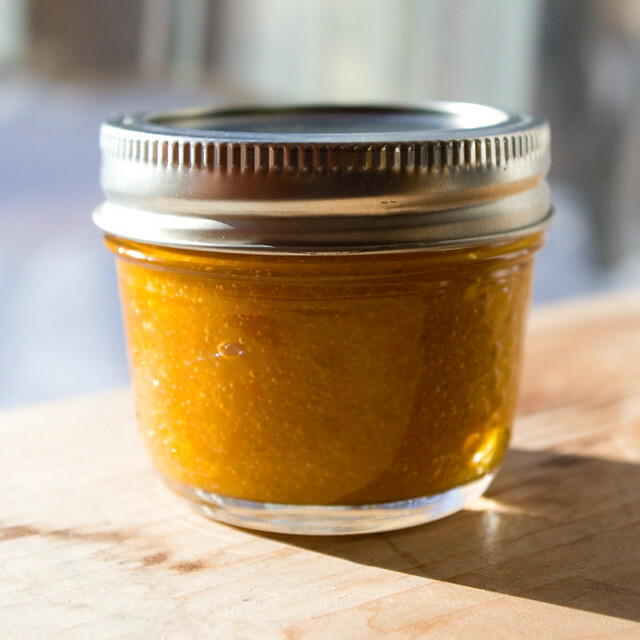 I base my hot sauce on the Essential Habanero Hot Sauce from Genius Kitchen. I got great reviews on the sauce last year. Although the heat of the sauce varies because every summer I grow slightly different peppers, I’m pretty sure that this year’s is at least as hot as last year’s because even just the vapours from cooking it completely cleared my sinuses. Let’s hope the people I am giving it to for Christmas like it as much! Dinner was what I think might very charitably be called deconstructed shepherd’s pie. I had taken the meat out earlier in the day to thaw, but by the time dinner prep time came around I knew I’d never have time to bake it as a casserole. 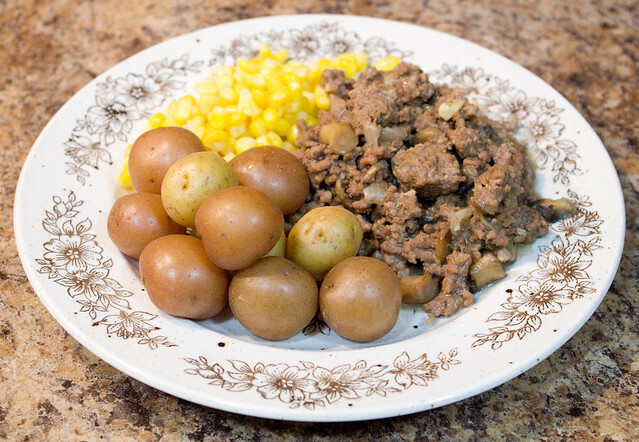 So I prepped the meat as I would for my usual shepherd’s pie (with a few extra mushrooms thrown in because that’s what I had in the fridge), boiled up some baby potatoes, and microwaved some corn. Instead of layering it into a casserole, I just served it as is. The kids ate all of theirs without complaint, and I found it almost as tasty (if not as creamy) as the real thing, so it worked out okay. Then I had to wrap Christmas thank-you gifts for my girls’ Guiders. Guide leaders are volunteers, and I think it’s important that they know how much my children and I appreciate all of their hard work. Without Guiders, there would be no Girl Guides. I couldn’t do what they do (despite having two children that I adore, my patience levels with children is not great), which is why I try to support them in other ways. 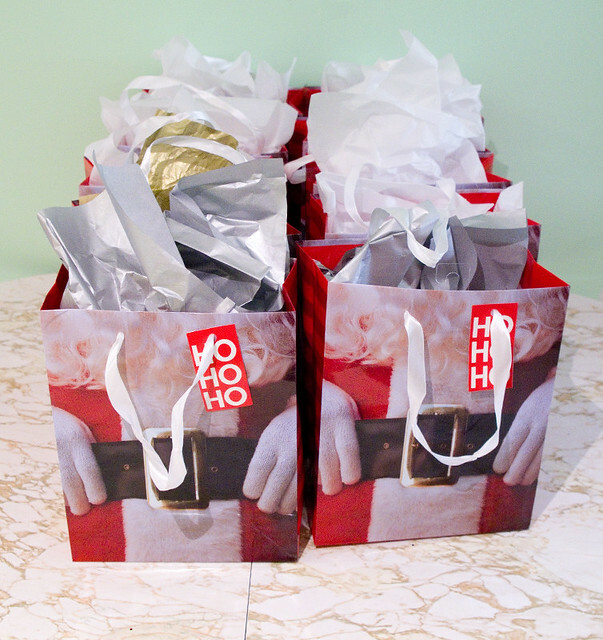 Although the bags look slightly different, that’s mostly because I ran out of white tissue paper near the end. They’re all identical inside, containing Amaretto Cherries and Cinnamon-Scented Parsnip Pear Jam. 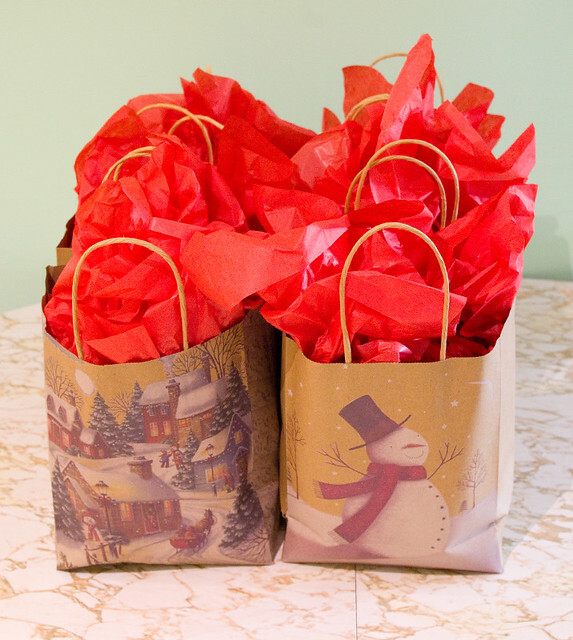 I am very quick at gift wrapping, having worked the wrapping station in a number of retail jobs over the years, which comes in handy when I have ten gift bags that I’ve forgotten to put together until the last minute. I could have sworn Thing 1 and Thing 2 had one more meeting before the holiday break, but obviously I was mistaken. Then I had to rush out the door to drive the kids through a snowstorm to their respective Guiding activities for the evening — Thing 1 to her pajama party and Thing 2 to sing Christmas carols at a retirement home. Of course, I got stuck spinning my tires on a patch of ice as I left my driveway, and luckily my husband arrived home just in time to help push the car. Then it was a very slow, cautious drive to the girls’ activities, then another slow and cautious drive to my parents’ place to help them put up their Christmas tree, then back to pick up the girls and get them home and in bed for the night, despite the huge amounts of sugar they had consumed. When all that was over, I had to relax a bit. 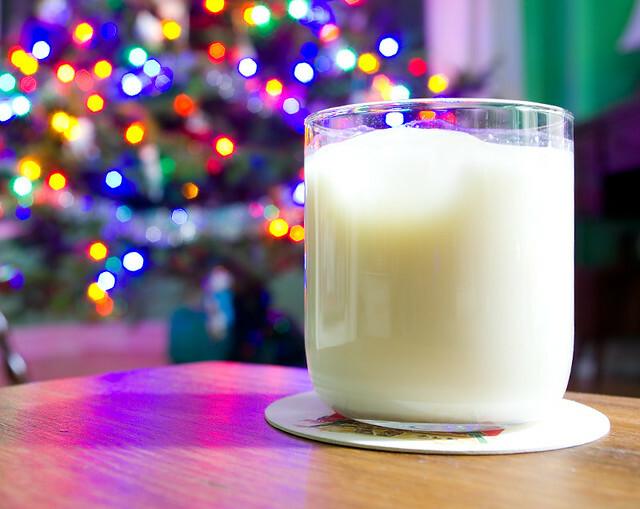 I poured myself a lovely glass of rum and eggnog (okay, Earth’s Own Almond SoFresh Almond Nogg, which isn’t a half-bad substitute for the lactose intolerant). I had a real tree twinkling with lights in the living room. And, at least for a few hours, I tried to ignore the fact that I had less than two weeks to go to get everything done before Christmas.